Frequent readers amongst you probably have been following my posts about the wedding that seems to have taken forever to arrive. A wedding where I watch my two best friends marry each other in a lavish ceremony. We are eventually on the home straight and in single figures until the wedding. I’m certainly not bridesmaid body ready but I’m an improvement on what I was when I first had my dress made. I mean it’s now had to be altered twice so I’m clearly winning here (or losing all for a better word). Anyways, I digress. Having been round at my best friend’s house to celebrate her early birthday, as I was away and she was finalising last minute wedding things I was excited to give her the birthday gift I had been trying to keep secret for a while when she surprised me with my own gift. Hang on how does this work? It was her birthday and not mine! You know that age-old question of what do you buy the maid of honour? Well, it’s safe to say Katie well and truly smashed the ball out of the park with the best chief bridesmaid present ever. Now some of you will know I have a penchant for all things luxe, I like to proclaim I’m a self-confessed princess and catch me on a bad day, my tantrums truly verify that. I come with genuine foot stamping! So with that in mind, what a truly wonderful gift don’t you agree? My best friend knows me so well. If you’re looking for a quirky gift for any occasion then I totally recommend a Lord or Ladyship for the person who has everything. Check them out here. These kind of gifts are hilariously funny yet suitably quirky and mementoes of crazy memories. Sure bottles and jewellery are nice, but something you can keep for all eternity is better and I’ll remember the journey of being my best friend’s Chief Bridesmaid every time I whip out my Ladyship title (especially for an upgrade!). It’ll sit perfectly beside my acre of land on the moon and my star too! I invite you all to come visit my 5 square feet of land in The Lake District at Hogarth Manor with a bottle of champagne. Pretentious? Moi? 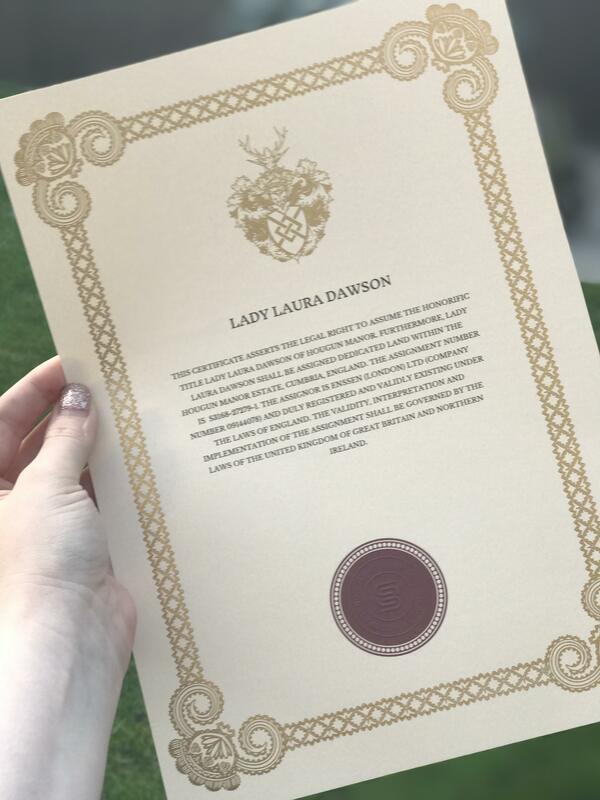 And please, it’s Lady Laura from now on. I know plenty of people that are hard to buy prezzies for but this will help should this problem occur in the future!